Rio will be available on 3-Disc Party Edition, featuring the Blu-ray, DVD and Digital Copy; as well as in a 2-Disc DVD Party Edition on August 2nd. We have not seen it yet, but are excited for its release to DVD since we usually rent movies after they have come out in theaters. 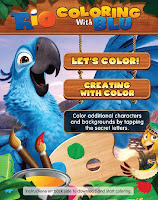 Along with the upcoming DVD release, a new Rio APP is available on Android Market and iTunes App stores. It has two characters and one background available for coloring. Once the DVD and Blu Ray release on August 2nd, the insert included will unlock the additional 10 characters and 4 backgrounds for a total of 12 characters and 5 backgrounds or 60 unique coloring pages! For those in the LA or NYC areas, a hands-on demonstration of the app will be available at Santa Monica Place in LA and Roosevelt Field Mall on Long Island at a KIOSK with iPads, approximately 40-49” off the ground, easily reachable by children, to try the app. 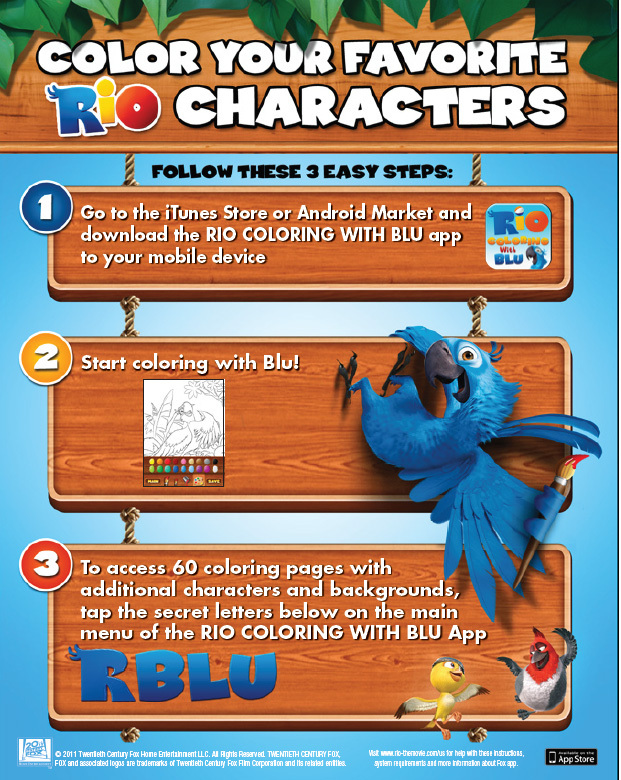 Rio is also celebrating National Friendship Day on July 30th with beach takeovers and ecards. Mall takeovers are happening in the areas below. 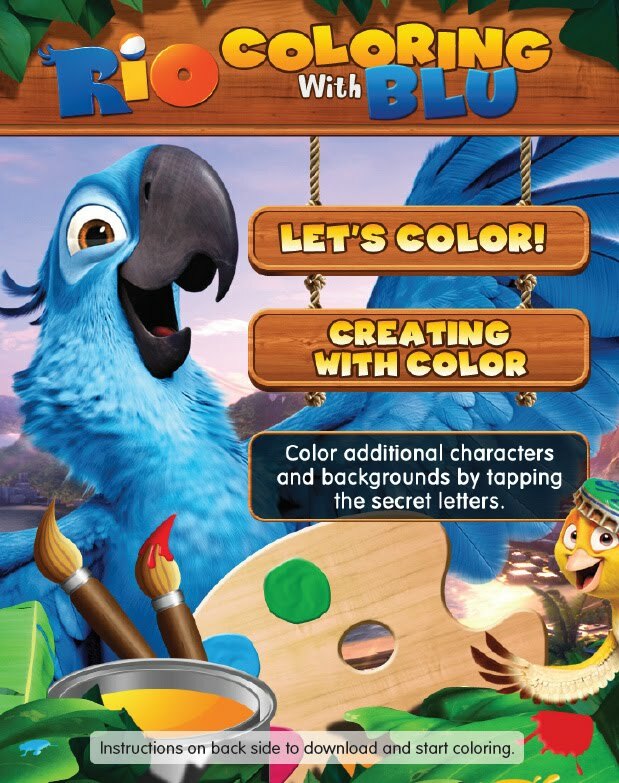 This will be a 2-3 hour event with the Rio trailer played, hands-on fun like making a friendship bracelet, creating your own mask, fun Rio activity sheets, writing a friendship letter, and taking the friendship pledge! You can find the dates to these events here. BUY IT: You can preorder the DVD on Amazon. GIVEAWAY: One of my lucky readers is going to win Rio on DVD! This giveaway ends: Thursday August 11th at 12:00 Midnight EST and is open to US Residents 18 and older only. Winner will be chosen randomly, emailed, and will have 48 hours to respond or another will be drawn. This prize will be directly shipped from the sponsor. Disclosure: I will receive a DVD in exchange for this post. Sponsor is responsible for shipping the giveaway DVD to the winner. 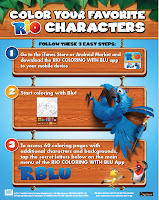 150 comments on "New Rio APP Announcement And DVD Giveaway"
I want to watch this with my three daughters! I want to watch this with my daughters! Love the commercials!! I would love to watch the movie with my daughter! I want to watch this movie with my hubby and my daughter. I'd love to watch this movie with my son who loves all things parrots and has been looking forward to this! Thanks for the giveaway! Would love to watch with my two boys! I'd like to watch it w/ my little cousins. I want to watch it with my husband. He's been waiting on this to come out on dvd so he can see it! I follow you on Twitter (@Celtic_Girl). I put your button on my blog, Hardcover Feedback! I want to watch this movie with my grandson. I for sure will watch this with my 4 kids and hubby! I love this show! So cute! I'm a new follower! Yay! i would love to watch this movie with my three sons ranging in age from one to seven. I have three little ones ages 3, 4 and 6 who my husband and I would love to watch this with on our Family Movie Night! i want to watch with my two kids and hubby. family movie night! I want to watch "Rio" with my two toddlers. I would love to watch this movie with my daughter and nieces! Hi, we would love this for Family movie night! Thank you! I'd love to win and watch this for my Niece! I REALLY want to watch this with my youngest son, he is almost 2 & my daughters they are 12 & 16. My older boys said they would watch it with me too. Yay! They are 15 & 17! I haven't seen UT yet but I can't wait! I really wanna watch it with my son and my daycare kids! I want to watch this with my three youngest daughters! I'd like to watch this with my daughter and hubby. I would LOVE to watch this w/my Grandson who's almost 4 & my Grandaughter who is 18months!!! ((1955nursehjc4me(at)myway(dot)com)) TY! I do follow you on Twitter. @longwait4bella is my username. 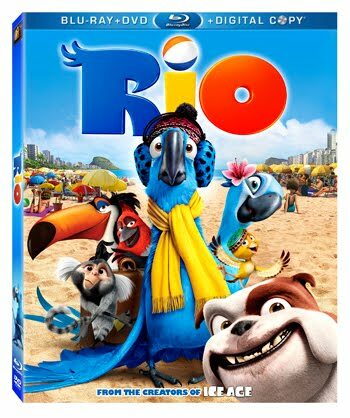 My children and I would watch this DVD, we haven't seen Rio yet!